The Military Selective Service Act (MSSA), first enacted as the Selective Service Act of 1948, provides the statutory authority for the federal government to maintain a Selective Service System (SSS) as an independent federal agency responsible for delivering appropriately qualified civilian men for induction into the Armed Forces of the United States as authorized by Congress. The annual budget for the agency is just under $23 million. One of the SSS’s main functions is to maintain a database of registrants in case of a draft. The agency stores approximately 78 million records in order to verify registration status and eligibility for certain benefits that require certification of registration for eligibility. The SSS has a staff of about 124 full-time employees, complemented by a corps of volunteers and military reservists. The MSSA requires most males between the ages of 18 and 26 who are citizens or residents of the United States to register with Selective Service. Women in the United States have never been required to register for the draft. Men who fail to register may be subject to criminal penalties, loss of eligibility for certain federal or state employment opportunities and education benefits, and denial of security clearances. Documented or undocumented immigrants who fail to register may not be able to obtain United States citizenship. Registration compliance rates were 92% in calendar year 2016. While individuals may still register at U.S. post offices, the SSS attributes high compliance rates to a system of automatic electronic registration supported by state legislation and interagency cooperation. The MSSA does not currently authorize the use of a draft for induction into the Armed Forces. When the draft has been implemented, it has met some public resistance. Such resistance to the draft drives much of the opposition toward maintaining the SSS and the registration requirement. Even some who are not opposed to the government’s use of conscription in a time of national need are opposed to maintaining the current SSS agency infrastructure. They argue that a stand-alone agency is unnecessary and expensive and that there are a number of alternatives that could more effectively and efficiently enable the country to reestablish conscription, if necessary. Others counter that, at the cost of $23 million annually, maintaining the SSS is a relatively inexpensive insurance policy should the draft need to be quickly reinstated. They also argue that maintaining the SSS sends a signal to potential adversaries that the United States is willing to draw on its full national resources for armed conflict if necessary. Some are concerned that the registration requirements are inequitable, arguing that it is unfair to men that women can voluntarily serve in all military occupations but are exempt from the registration requirement and the prospect of being drafted. In addition, some have raised concerns about the statutory penalties for failing to register and whether these penalties are more likely to be levied on vulnerable groups. Some contend that Congress should amend MSSA and associated statute to remove penalties for failing to register. Others argue that weakening or removing penalties would cause registration compliance rates to fall to unacceptably low levels. 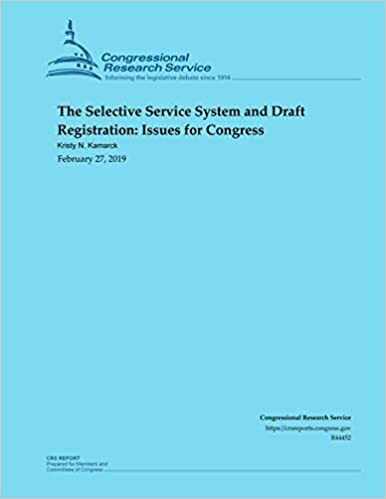 In response to these issues, Congress has established a National Commission on Military, National, and Public Service to provide research support and recommendations on the future of the SSS.